The storm, which battered residents from North Carolina to Maine, was blamed for at least five deaths. The five killed during Friday’s storm included two children. A man and a 6-year-old boy were killed in different parts of Virginia, while an 11-year-old boy in New York state and a man in Newport, Rhode Island, both were killed. A 77-year-old woman died after being struck by a branch outside her home near Baltimore. Waves crash over houses on Turner Rd. 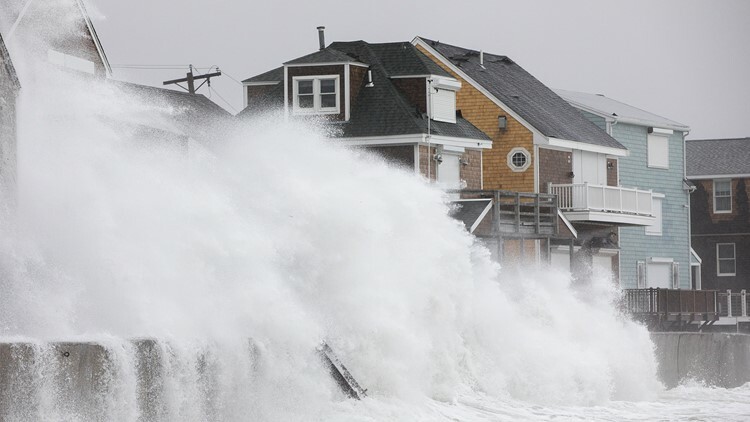 as a large coastal storm affects the area on March 2, 2018 in Scituate, Massachusetts.